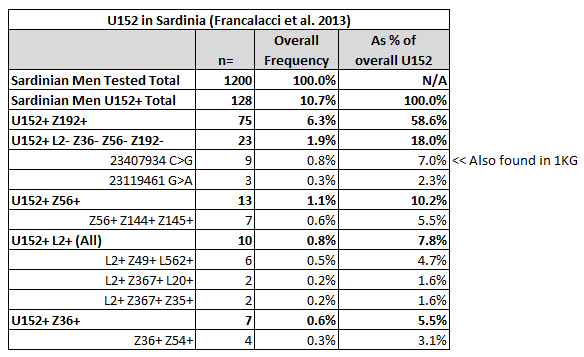 At the opposite end of the spectrum we have L2 and Z36 which make up only small percentages of both U152 and Sardinian males overall. It is difficult to see either in the context of large migrations from the peninsula. Z56 is slightly more frequent than L2 and it’s Z144/Z145 subclade makes up the majority of Z56. Sardinian U152, where a single subclade is so dominant (Z192), contrasts with the completely diverse scenario in Tuscany, where no single subclade is found in dominant numbers over another. U152 frequency in Tuscany is also several times greater than in Sardinia based on 1000 Genomes data and that of the recent Boattini et al. study (see here:http://www.r1b.org/?page_id=242). 1. Sardinia is heavily concentrated with Bell Beaker material when compared to most of peninsular Italy. 2. Sardinia also has a heavy concentration of statue-menhirs. They are very similar to those found in Liguria and the Alps. 3. Archaic Sardinian was a non-IE language, and based on place names, has recently been linked to Basque. It is difficult to not see an I2a1-M26 connection here. 4. Sardinia has the lowest R1b frequency in Western Europe, but most of it is P312 instead of Z2103/Z2105. 1. DF27 may have been brought by small amounts of Bell Beaker people from Southern France via Tuscany. 2. While the traditions of Bell Beaker caught on, it does not seem like their genetics nor their presumed-IE language did. 3. Z192 might be a founder affect carried over from a U152* male somewhere close to Sardinia/Tuscany during the Copper Age or even with Bell Beaker itself. 4. The absence of major continental U152 sub-lineages like L2 and Z36 points to their trickling in after Bell Beakers. I had mentioned previously that L2 might be related in Italy to the Early Bronze Age Polada Culture which has a heavy Central European influence. A small amount of Polada Culture material has been found in Sardinia. This is a pilot project to study the Y-DNA from the skeletal remains of Copper Age Europeans with the goal of finding the source of Y-chromosome R1b's spread. R1b.org is proudly powered by WordPress and BuddyPress. Just another WordPress Theme developed by Themekraft.